Toronto (ON), Canada - Zevrix Solutions announces the release of BatchOutput DOC 2.5.6, a compatibility update to its output automation solution for Microsoft Word on macOS. The only batch processing tool for Word on the Mac market, the software helps users eliminate repetitive tasks through automation of printing and professional PDF output. The new version introduces support for the recently released macOS 10.14 Mojave and is offered as a free update to the licensed users. While BatchOutput DOC is fully compatible with the new Dark Mode, the app currently preserves its original appearance. A dark appearance will be introduced in the future. 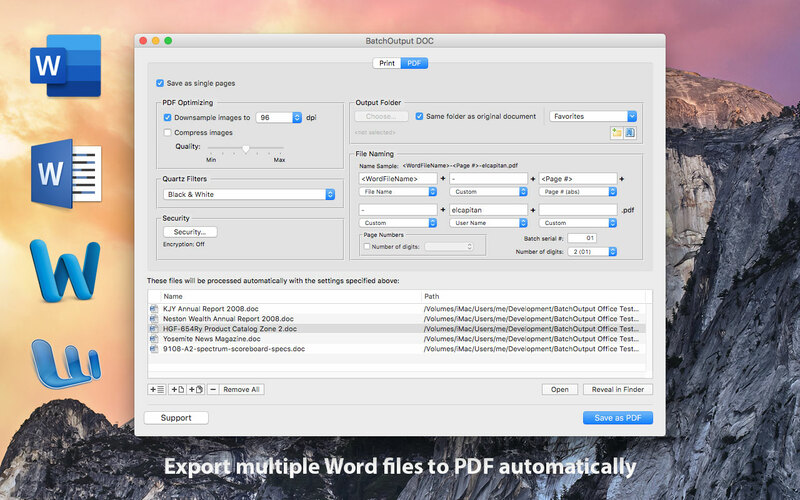 * Print and export multiple Word documents to PDF with a single click. * Variable output file names. * Split Word files into single page PDFs. * Reduce PDF file size and optimize documents for web, print and mobile devices. * Encrypt and password-protect PDF documents. * Change PDF color tone, brightness and other qualities. BatchOutput DOC can be purchased for $19.95 (USD) from the Zevrix Solutions website as well as from authorized resellers and Mac App Store. Trial is also available for download. The update is free for users of version 2 and $20 from version 1. BatchOutput DOC requires Mac OS X 10.6-10.14 and Microsoft Word 2008, 2011 or 2016.